My goal yesterday, when I set out with my friend and hiking buddy Kathy, was to show her a secret hot spring in the middle of the desert (shared with me earlier by buddy Roxanne). The plan was to drive the quad to the site, take a peek without disturbing the natural area, then explore along the riverbed. As we were tooling along the outskirts of the riverbed, I looked to my left and, to my surprise, discovered that the normally dry river was flowing from the monsoon rains we’d been getting! So, before the flow got any heavier and whisked us away, we decided to formulate Plan B. After maneuvering up to higher ground, we parked the quad and set off on foot. Oh the things you will see and hear in the desert when you’re close to it, walking quietly! 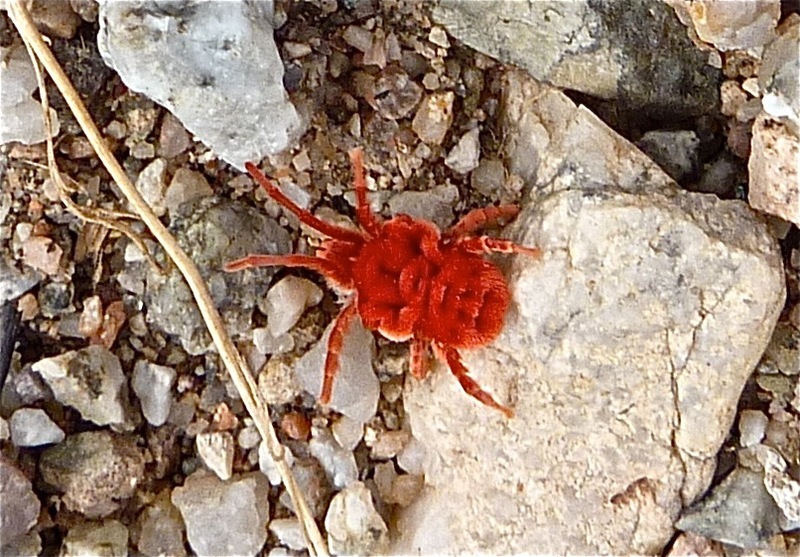 We were mesmerized by a Red Velvet Mite, an insect that I learned comes out only during the rainy season – sometimes staying buried in the soil for years! His only source of food is the flying termites that seem to go nuts after a rain, swarming and skittering through the thick air. Velvet, by the way, is the perfect description for this mighty mite. I was tempted to reach down and pet him, but didn’t know if I’d be bitten (other fuzzy insects in the Sonoran Desert deliver painful stings). The trip didn’t end with the discovery of the velvet mite, though. We also saw a beautiful red-tailed hawk and heard intense reverberations coming from a large cavernous opening. At first, I thought that flowing water was moving beneath the rock somehow (maybe I was secretly hoping for hot spring no. 2?) … But when Kathy said calmly, “bees,” and I saw them – thousands of them – buzzing in and out, I realized how wrong I was. That seemed as good a time as any to turn around and complete our trip through the sticky humidity. But what I learned most is that sometimes failed plans lead to even more discoveries! *Originally published at What I Saw. Reposted with permission of the author. Now no one can ever say a Raspberry zinger is a color not found in nature! I love those surprise findings. We went on a hike once that took us off the trail several times due to fallen trees. We uncovered all kinds of things we never would have seen otherwise. Ha – yes … there is nothing new that is man-made that Mother Nature hasn’t already created (color-wise, for sure. We have an emerald beetle out here that is an incredible metallic green – the likes of which is often on hotrods). I agree; those ‘wrong paths’ often result in the most exciting discoveries! Ha! Edible food is probably the last thing I think about when I see him. Spider? Followed by — danger?